« A tale of two “Champs”. 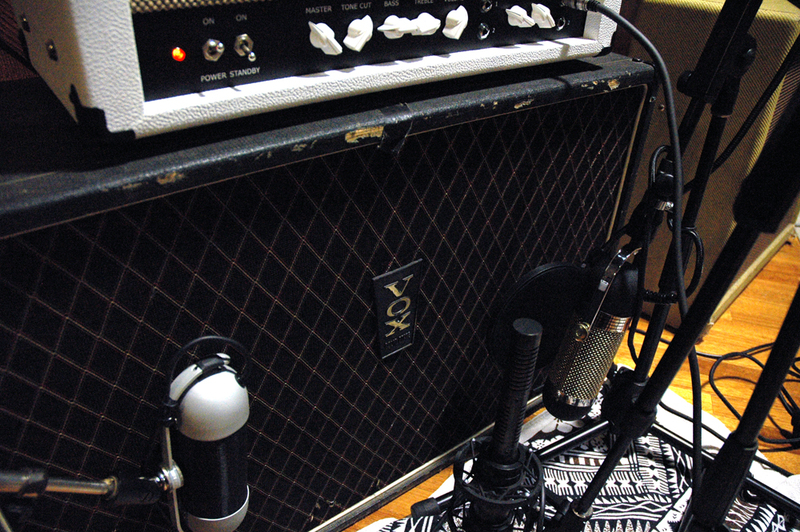 A Richards ‘Expressionist’ amp with very expensive mics in the studio. Here we have some photo’s of the 15-watt Studio Expressionist model amplifier (head), one of the range of hand-wired, all-valve (tube), custom musical-instrument amplifiers from the Richards Amplifier Company – Australia. The photo’s were taken by Adam Gresty, during the recording in Adelaide, South Australia, of the debut album by Slow Chase. Slow Chase are a rock-band from Melbourne, Australia, featuring drummer Emily Shaw and singer/guitarist Adam Gresty. The band’s sound has been described as T-Rex meets The Pixies, but has also drawn comparisons to modern British rock-band Kasabian, and West Coast hard rock bands like Spinnerette, Sweethead and Eagles of Death Metal. Recorded with ARIA award winning producer Jonathan Burnside (The Living End, The Sleepy Jackson, Fu Manchu, The Melvins, Grinspoon and more), Slow Chase are due to release their debut The Blind Spot EP during 2011. Ivan, I’ve just got back from recording my band’s debut album in Adelaide. I’ve attached some photo’s I thought you would like to see. Unfortunately I wasn’t able to take the Richards 1×12 Tone Cabinet with me, but the Studio Expressionist head did make the journey and I’m very pleased to tell you it was an absolute bloody triumph. 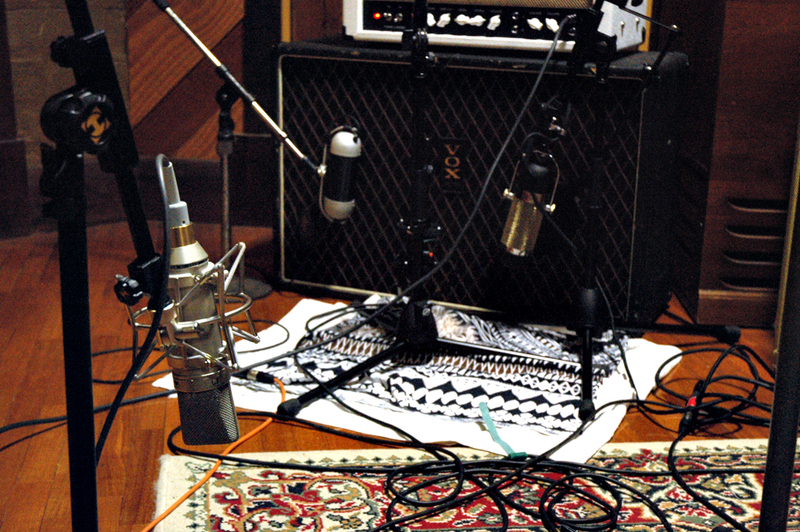 The photo’s show the amp with, oh, y’know about $15k-$20k worth of microphones on it. *Mic details: AEA A840 large diaphragm powered ribbon mic, plus AEA R92 large ribbon studio mic, plus Royer SF24 phantom-powered stereo ribbon mic, plus a vintage Neumann U67 for room ambience ! My producer Jonathan (I think I told you he’s an American guy, worked with Nirvana, Faith No More, etc, but has also produced a lot of successful Aussie bands, and received the Aria awards for The Sleepy Jackson, plus Dallas Crane, Eskimo Joe, The Grates, The Living End, Dan Sultan, Whitley and loads more), well, Jonathan was completely enamoured with it. Couldn’t get over how easy it was to dial in a killer tone and the flexibility the different voiced channels plus the switchable output valves (tubes) in the power section offered. From vintage to modern. We even used it for doubling up DI’d bass parts. 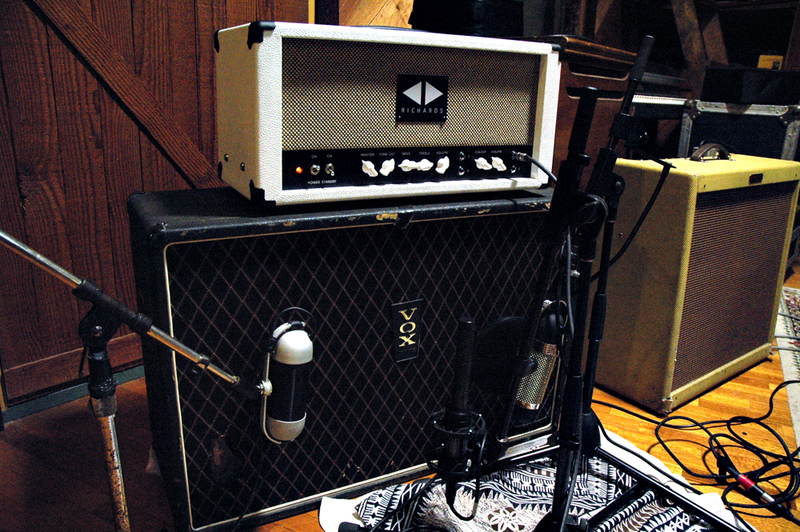 It was the only amp we used on the album. So thrilled I managed to get it to the studio and it’s now the heart and soul of the first Slow Chase album ! Jonathan christened the amp Jagger, which I thought was hilarious, ref Jagger/Richards. Can’t wait for you to hear the album, although it will be well into 2011 before it’s been mixed down and mastered. Well – many thanks to Adam for that great story which now features as this week’s Blog. I’m sure that list of mic’s will make many a home-studio owner envious. In a forthcoming Blog, we will feature a testimonial from producer Jonathan Burnside, so watch out for that. Until next week, thanks for checking out the Blog and please feel free to contact me by email re any enquiries. This entry was posted on July 10, 2011 at 7:23 am and is filed under Amps. You can follow any responses to this entry through the RSS 2.0 feed. You can leave a response, or trackback from your own site.